Surprisingly enough sales dropped second week to third, but we'll still easily exceed last year's total. Time for another prediction thread. What will happen in 2014? 1. VREB sales of 6200 (up slightly from 2013). As for macro events, the larger economy will be sluggish and boring, with Canada not making any headway on unemployment in 2014. We will be teetering on the edge of deflation, and if the Bank of Canada is going anywhere it is more likely to be to cut rates than to raise them. The US will slowly dial back stimulus but in baby steps. Fixed mortgage rates within a narrow range of current values. 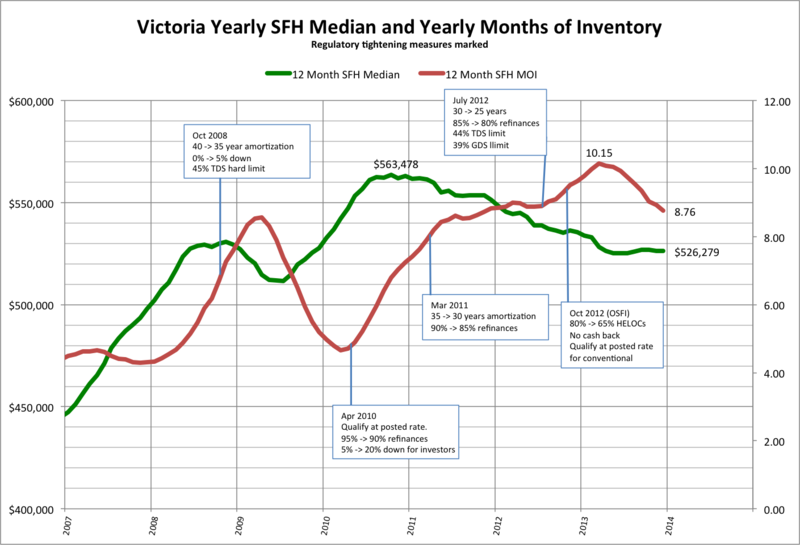 We are off the recent peak of months of inventory as the last mortgage changes worked their way through the market, but as the rest of the country goes gangbusters, I suspect there will be more tweaking of the CMHC this year. Something less headline grabbing than a reduction in the amortizations, perhaps a tweak to the maximum TDS ratios. The linear sales projection is meaningless in a month like January where sales increase strongly from the first weeks. We'll be well over 300. You can tell it was a blustery rainy weekend by the number of comments and number of mentions of Phoenix. Sales total should be around 360 if current pace continues..
Hey it's a new year. To get the year started on an positive note, home owners around the Greater Victoria area will be getting their assessment to let them know how many tens of thousands of dollars their largest asset declined by this year. It's a mixed bag out there, but negative across the board. A whopping 10% decline in Metchosin, but who cares about those farmers, here in Oak Bay we are insulated. Yep, a paltry $2000/month decline in value for the standard house there. Our assessment is down 4.6%. Interestingly enough, the bank assessment done in June 2013, was 5% higher than the 2013 BC assessed value which is supposed to reflect value as of July 2013. Seems like quite the variation. Either banks like higher assessments, or the appraisal procedure consists of taking the current BC assessment and adding or subtracting a random small number (Just Jack are you offended yet?). Also apparently the land lost value, while the building increased. Didn't know that buildings age like wine... Or maybe they noticed that I scraped the moss off the roof? The more sophisticated measures of price have made it clear that despite static medians and averages, the market continues to decline. Assessments down 2% to 5%, and MLS HPI and Teranet both down 2.4%. 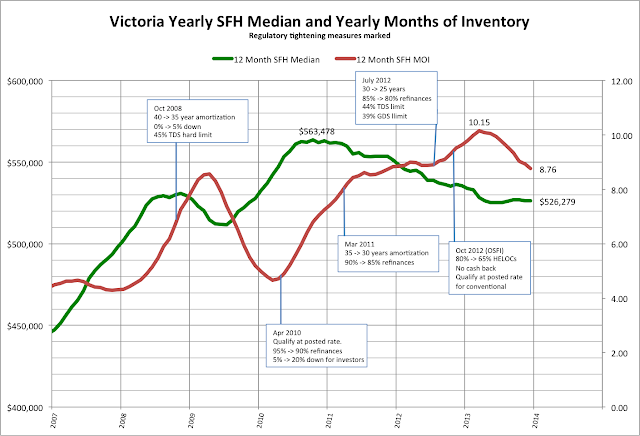 As you can see, the median price declines have flattened out due to changes in the sales mix, while the months of inventory has recovered from our little government meddling last year. I would expect median prices to start declining again in 2014. Thanks to everyone for your contributions and comments on the blog last year. It'd be a boring place without your input.